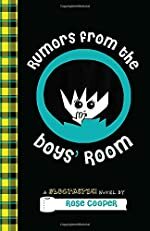 Rumors From the Boys' Room by Rose Cooper. A Blogtastic! Novel. Review: Hilarious, witty, and creative all describe the book Rumors from the Boys' Room. Rose Cooper does a great job portraying the strong emotions that the characters have for each other. The main character, Sofia, is a nosy seventh grade girl with a blog that she finds to be oh so popular but it is really is not as popular as she thinks. This is an anonymous blog, so no one in the school knows she is writing it! This fictional novel captures your mind while you read it. This is the second book in Blogtastic! The first book is called Gossip from the Girls' Room. What a great story from a great author. Our story starts with our main character Sofia rethinking her ideas about blogging. She decides to only use rumors that she hears herself and publish them on her blog. Sofia's best friend Nona has this developing crush on the knew foreign exchange student named Lukas from Germany. Sofia, on the other hand, has a crush on a boy named Andrew. Although he has a crush on her arch nemesis, Mia St. Claire. Although this makes Sofia infuriated she has a school project that takes up much of her time. She blogs all about the gossip around school not always having the best sources or the most reliable information. In her mind, she thinks this will make her popular when she reveals her identity as the Blogtastic Blogger. This is a great way of showing exactly how rumors are spread though blogs and the internet. I found Rumors from the Boys' Room to be a great way of showing how rumors can be spread way out of proportion. Things that are not true are often posted on blogs and sent in texts and after that, the whole world can read about them. Rose Cooper did a good job giving the characters real life emotions and really showing that through how they act and what they say. You can feel Sofia's hate for Mia by how she refers to her and how she talks about her. You can also tell how much she loves being Nona's friend by what she says about her in her journal. She also shows how characters grow and develop in their middle school years. Cooper displays how people change, as they grow older and what happens to many kids in middle school. There are some extremely funny jokes and great dialogue. Rose Cooper puts together an all-together great book that can be very real and and little bit of not real. It all comes together to make a truly spectacular book. Review written by Kathryn (7th grade student). We would like to thank Random House for providing a copy of Rumors From the Boys' Room for this review. Have you read Rumors From the Boys' Room? How would you rate it?